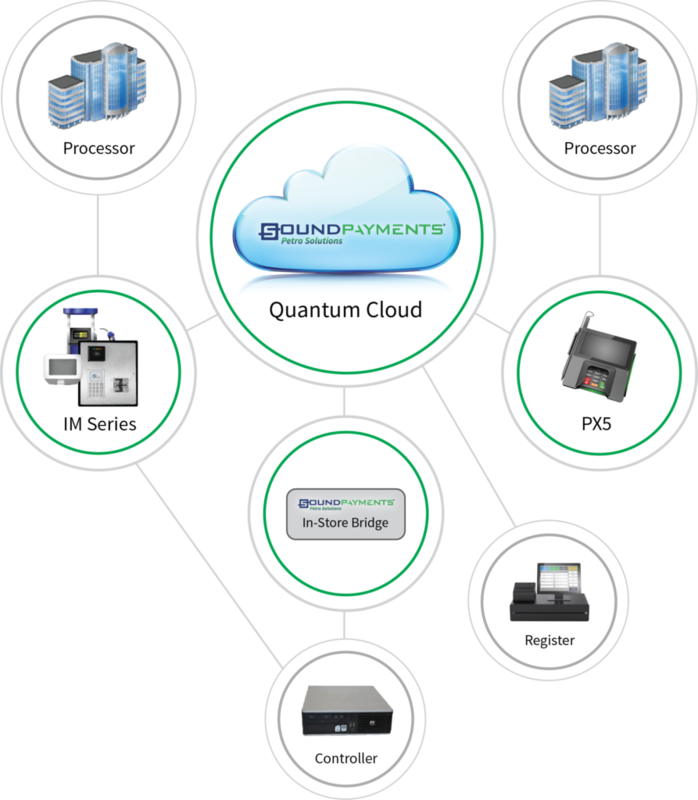 Quantum Petro provides multi-point, cloud-based technology solutions for the petroleum industry. Our team is comprised of payment industry experts and engineers who recognized that a piece of the puzzle was missing for many small to medium-sized petro companies: the need for a cost-effective, state-of-the-art cloud-based platform that allows for the delivery of innovative services and eases installation challenges at the pump. C-Store and Petroleum retailers are struggling with the high cost of upgrading fuel dispensers to accept EMV cards. Sound Payments Petro Solutions is a multi-point, cloud-based technology offering a unique retrofit payment solution for the petroleum industry that is cost-effective, PCI compliant, and accepts EMV, Mag-Stripe, and Contactless payment transactions directly at the pump. Independent stations can now meet industry requirements without expensive upgrades or closing stations for several weeks. The all-in-one payment terminal supports QR code scanning, PIN-one-glass, MSR, EMV chip and PIN, NFC for Apple Pay and Google Pay, bluetooth and Wi-Fi, and includes a built-in security camera. The device is simple to install with only one cord for power. The Petroleum industry has a mandate to move to EMV by 2020. Due to the infrastructure constraints, this can be a costly endeavor for Petroleum Stations (can be between $60-$200k or more for a smaller location). In the petroleum industry, the lack of cost-effective, simple solutions that allow for innovative consumer services while handling EMV puts many small to medium-sized companies at a disadvantage. We can help solve challenges at a much lower price while providing the features and functionality to make a station more profitable. The up-front cost for a station is an average of $10k with a monthly service fee that is an average of $400. This estimate is calculated based on 8 pumps at a station and is the total cost per station.